Well, it's Monday. I normally don't struggle with Ihatemondayssomuch issues, but this morning was rough. I am getting more and more tired so every morning feels like a bit of a struggle. Plus, everyone (thank you, strangers!) has been making comments about how tired I'll be after the baby is born, so that isn't helping anything. Anyway, I started this morning off with a pumpkin spice latte (half syrup - believe, me it's so much better) which seemed to help a little bit. In clothing-related news, this is the first time I have worn a button-down shirt open over another shirt. I think I was secretly afraid of looking too 90s, but I'm glad I tried it out. This pregnancy thing is forcing me to get creative, which I kind of love. 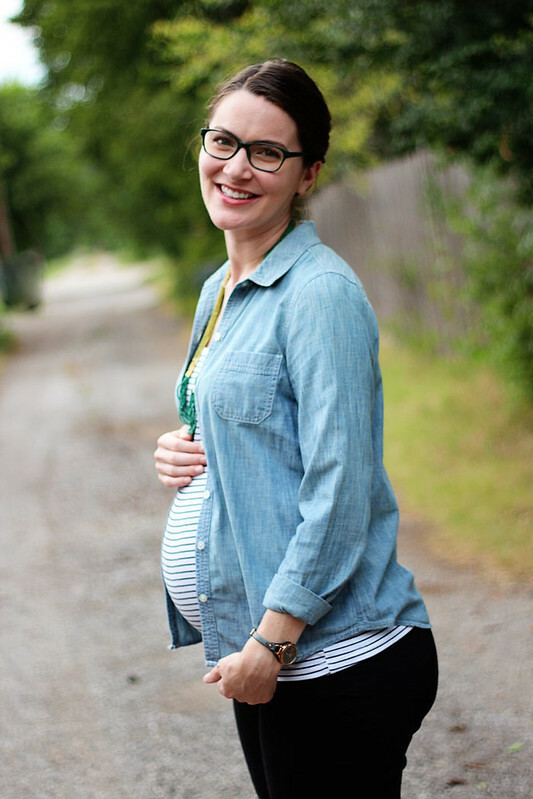 I don't want to buy any more maternity clothes (only 9 more weeks!) so I am making myself wear pretty much anything I can squeeze into. I don't think it looks too 90s at all, but I know where you're coming from as much as I did it growing up. Oy. 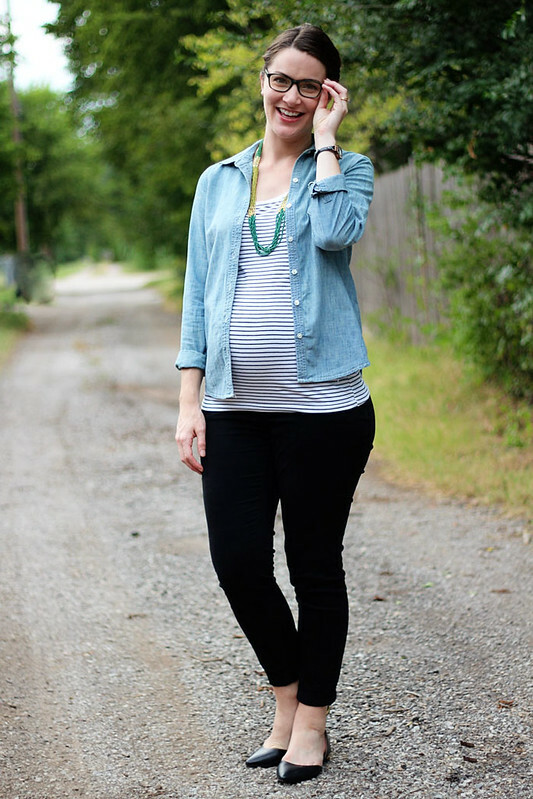 I love the classics in this outfit-- chambray, stripes, black. Very chic and Parisian feeling. I keep seeing others wear the buttons downs like that and have yet to try it--but I need to because you all look so cute :) Love you in your glasses too!! I think it is a clever way to still wear button shirt that don't button! And I don't think it looks 90s at all, but even if it did, isn't that all coming back around? This looks super cute and definitely not 90's! The next 9 weeks is going to fly so make sure you take it all in and enjoy it! I think you look great! I hear ya on the Mondays! 9 weeks will fly! It's clearly been too long since I last stopped by your blog, because I had no idea you were pregnant! Congratulations! I can't wait to hear all about the little baby in your life once s/he is born! Also, I think this is a super cute outfit. I love button ups over other shirts, in fact I've been really wanting to buy a new chambray shirt that buttons all the way down (my current one only goes half way) for just this reason. Also, ignore all those people telling you how to feel after you give birth. Even if you do end up more tired, you will have so much joy from your new precious little one that you will probably feel like every yawn is worth it! Just look forward to the future! I really like this look Ashley! I'm styling my chambray for the first time today and haven't quite figured out how to nail the casual open shirt look. Your bump leaves yours hanging open in the most perfect way. And the black ankle pants. I was just telling Danielle that I need to find a good casual pair. I love the look of these type of shoes, but I've always thought they would be super uncomfortable. Can you confirm/deny this? You sure are a beauty! 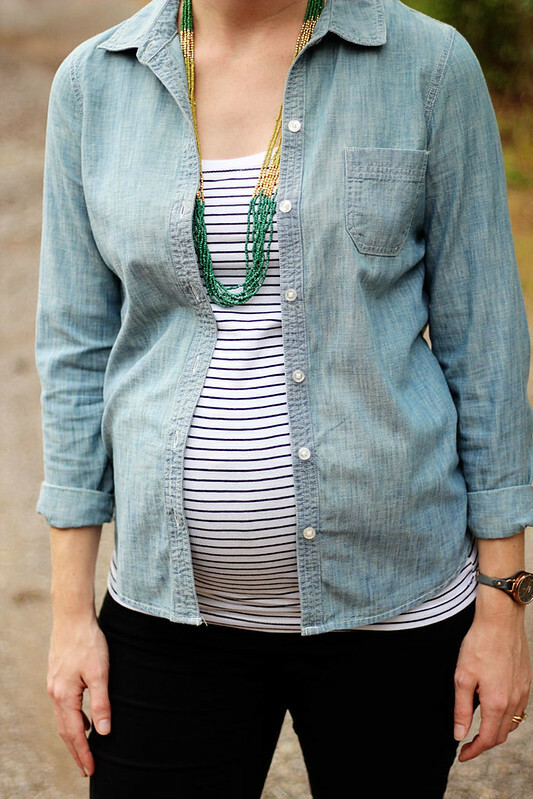 Love the chambray with stripes! 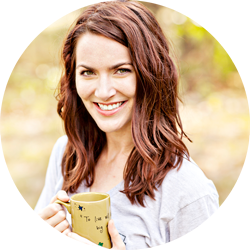 I love wearing my chambray shirt open like this - I do it frequently on weekends in the fall/winter with leggings and boots and a tank underneath - it's just so comfortable! And in your case, what a great way to make your non-maternity wardrobe work for you!! I wore my chambray shirt unbuttoned with a black shirt under it today. I like your stripes more though! I'll have to remember that for next time. I wear chambray shirts unbuttoned way more than I wear them done up. My reason is just because I'm larger chested and buttoned shirts never really work well. Ain't no reason why you can't rock the brights at this time of year! Isn't that why they invented bright corduroy pants? I love wearing my blinding bright pants in the colder months too. Love your shoes as well. Super sleek! I absolutely adore this look - it is just perfect. 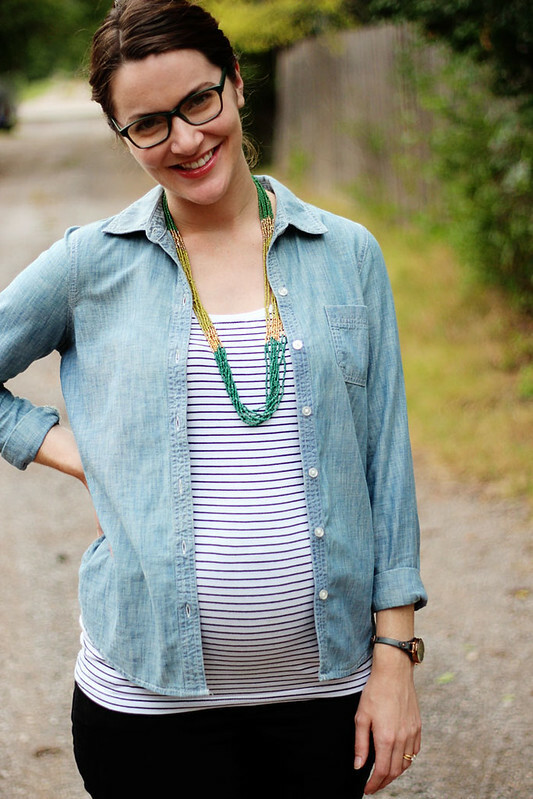 The necklace is the perfect pop of color, and I definitely like the chambray open over the striped top. I feel you, it was a hot and long Monday here too! 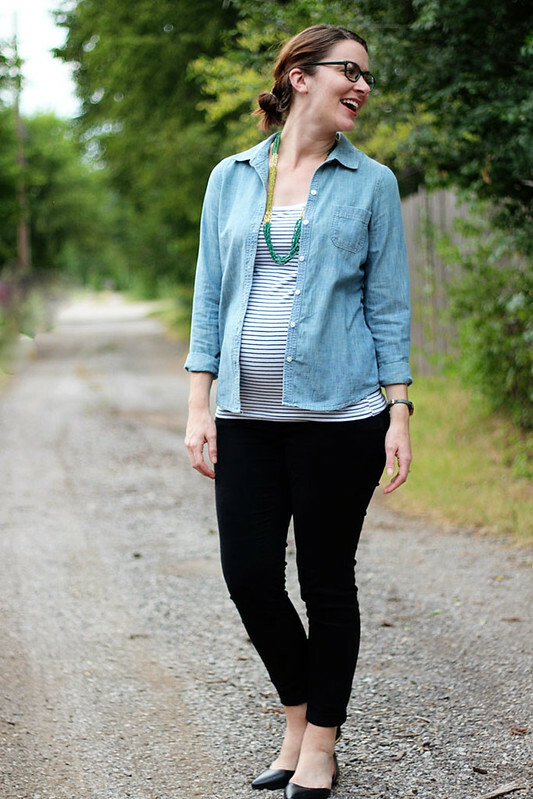 I need to start layering my chambray like you soon! I like the open button down here, I wore this look in the 90s too, but I feel Ike it was more with oversized plaids, not a more fitted chambray. Hoping you sleep well, I was exhausted during the last trimester too. You are adorable & look so put together in this outfit!! That used to bother me too when everyone would tell me how tired I was going to be after the baby arrived & many other negative things. Hope you get good rest. look at you with your hand on your back and everything. i hope the strangers shut up soon, but i am guessing they won't ;) nine weeks!!! i am so excited for you! ps you look super cute! I don't think it's too 90's, you can definitely make it work. Seriously! Isn't it annoying how people think they should tell you all the negative things about having a baby - like how tired you'll be. It's so frustrating! You just look adorable!! I got that a lot too when I was pregnant. I sure wish people would focus on the positive - and even though there are tough times, I think encouragement would be better than being so negative! Try not to focus on those strangers, they probably do that to everyone - pregnant or not!! Mocha lattes are my "treat" drink at Starbucks. About two or three years ago, I started asking for half syrup and it's made a world of difference. I'm sorry to hear about having to deal with strangers, it really sounds awful and would make me want to wear a mumu 24/7. Ahhaha I held off on trying the open button-up as a layer for a while because I had the same 90's anxiety. But I started trying it over the summer and I really like it now!